Update: English edition of this book is available. 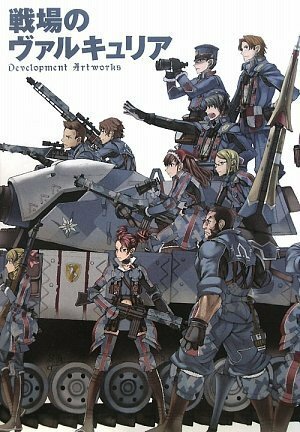 Here's the art book for Valkyria Chronicles, or in Japan which is known as Battlefield Valkyria: Gallian Chronicles (戦場のヴァルキュリア -Gallian Chronicles-, Senjō no Varukyuria -Gallian Chronicles. It's published in 2010, almost two years after the game. This is a 400 page paperback art book with the dust jacket. The pages are non-glossy matte, my favourite type. There's plenty of character design. There are so many characters I lost count somewhere. Each character has different drawn profiles, uniforms, weapons, armour and gadgets. Just like the game, all these are in watercolour style with pencils. There's also plenty of (Japanese) commentary. This book might be relatively pricey but it's well worth the money. It's loaded with so much content that every page takes a while to admire. There are so much details to see and much to read. Been trying 2 get this book! Been trying 2 get this book! SO HARD!!! >< BUT SO WORTH IT!!!! Damn, I thought "hey go to yesasia.com and buy it" but unfortunatly... it`s sold out. I really would like to buy it (a few times more than the really pricey Uncharted Artbook) but it seems I won`t get it ever. Wow! What a book! Its great how sometimes you may never have heard of some things, but still produce awesome and inspiring pieces.